A Counselor’s Thoughts on Indecisiveness – – How can we get through to the other side? With each new year, many of us ponder on things we might like to change. What do you want to add to your life? What could you benefit from getting rid of? Do you want to start a new career? Do you really want to be in a relationship? Do you want to stay in the relationship you’re in? 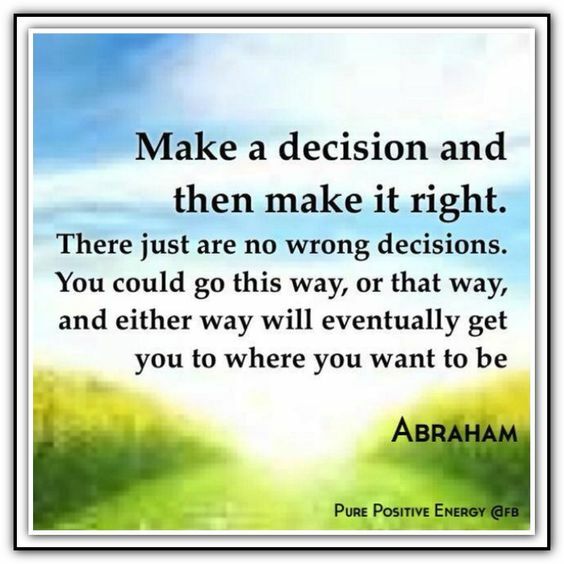 No matter what you’re trying to decide, many of us are faced with indecision. When you’ve found your answer, if it’s the right one for you, you should feel at peace. Your decision is yours alone; so listen to the things you say to yourself. Can you give yourself permission to be open to making changes that could enhance your life? Get to know yourself. If you happen to remember the movie with Julia Roberts, Runaway Bride, it turns out that she doesn’t know herself, right down to how she likes her eggs. Not knowing how you like your eggs isn’t that detrimental to your life, but it can be an issue when it comes to bigger decisions. Try it out. If something has been on your mind, maybe for a good while, try it out and see how it fits on for size. It surely could be something you’ve never done before. Trying it out can help you feel if it’s right for you. If it’s a different career path, you could shadow someone in that career and pick their brain. If you’re not sure you want to be in a relationship, dating and seeing how it goes may lead you to your answer. If you’re not sure that you want to stay in the relationship you’re in, you have some very important, personal questions to answer for yourself. Taking time to and for yourself may help you find some clarity on what’s best for you. Doing is believing. We really can’t tell what the future holds, until it’s here. Work on having confidence in your decisions, and think them out, but try to not overthink them. You may end up sabotaging yourself. Can you make a move towards change, trust yourself, and let go of the outcome--knowing you’re working towards the greater good for yourself? Watch out for being impulsive. To continue, sometimes, we exhaust ourselves thinking of all the possible outcomes that we make decisions on impulse, instead of going through the sometimes painful process of making a decision. If you have a history of making choices that haven’t worked out well for you, based on impulse, it’s probably better to think it out. I can personally tell you I’m guilty of indecisiveness myself. But, after I’ve pondered, and then let things sit with me, the answer seems to magically come. It’s almost like the answer has been standing in front of me the whole time, and my decisions have feel right. Trust yourself. Has there been a decision you made that turned out great? How did you feel while making that choice? What made it a great choice? If you look back on the positive decisions you’ve made in the past, this can show you that you’re capable of making other great decisions. Make the tough choice. Sometimes choices we have to make are tough. Some decisions we make now may limit our choices later. If we have limited choices, we may end up feeling stuck all over again, then contributing to added stress or anxieties. Let the excitement of who you can be overcome your fear of making a rough choice now. Do what you’re passionate about! If you’re on a path you believe in, you have less chance of regretting it later. The adage of doing something every day that scares you has great meaning. When we overcome our fears for the greater good, that’s what helps us grow. What if there was a magic wand? What if I could wave a magic wand, and you could have whatever you wanted? What would you then see in your life that made it better? This can help give you a glimpse of the future, even if we can’t see it now. Yet, this can help give you a picture of where you want to be, and what you want your life to look like. Take small steps. It’s not always as simple as the ideas above, but taking steps in a different direction might help you decide which way you want to go. Setting small goals can help you overcome your anxieties about making bigger decisions. Breaking things down helps a decision not feel so overwhelming. Listen to your inner voice. Let it tell you what you really want. Don’t be afraid to make mistakes, or to fail the first time you try something different. Life-changing decisions can be just that. Hopefully this inspired you. Please feel free to share it with someone else that’s struggling with making changes or important life decisions. Feel free to reach out here if you feel you could benefit from working on changes in your life. Watch out for being impulsive. Do what you’re passionate about! What if there was a magic wand?